The origins of reflexology can be traced back to about 2330 B.C. in China. 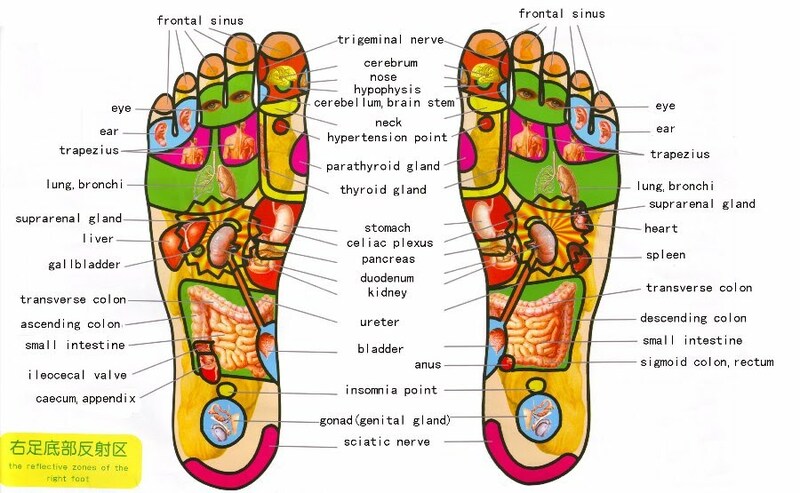 Based on Traditional Chinese Medicine, all the organs in your body are represented in your feet. Your feet also have the largest pores in your body for detox. Our full body reflexology treatments straightly follow Chinese Traditional Chinese Medicine theories, use Chinese herbal detox and a mix of Chinese Qi meridian methodology, acupressure, pressure point therapy to increases circulation, rebalances the body's energy system, and your body's “Yin-Yang” elements. Our sessions start with soaking your feet in hot water infused with 100% Chinese herbs for detox. As you soak, the toxins are drawn out through your feet and ankles. While you soak, you will experience a relaxation therapy on your face, head, arm and hands. When the toxins are drawn out, your feet will be dried, and our reflexologist will apply a healing foot reflexology massage. Our reflexologists will ask you ahead of time if you want to be pressured soft, medium, or hard. As the reflexologist applies pressure to the various points, please let him/her know if the pressure is too hard or too soft. It is normal to feel some pain during a reflexology session, especially in early treatments. The reflexologist will then relax your neck, shoulder, and back. Your body will be encouraged to relax as you lie on our comfortable massage table and listen to the music. A traditional Chinese Medicine herbal tea will be served at the end of the session. During the entire session, you are completely clothed. Pacific Harmony has carefully selected a variety of Chinese Traditional Medicine, Tibet Medicine, and other popular soak for you to enjoy. Make an appointment today to see how it feels to be properly aligned! Grand Opening Special: Eyebrows Threading $10!